Hannah Sink, age 15, Fishers, IN, has been dancing ever since she could walk and has been taking ballet classes since the age of 3. 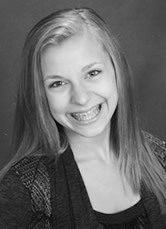 She trains locally at Central Indiana Academy of Dance with Suzann DeLay in Carmel, IN. Hannah has been blessed with many performance opportunities over the years. She has performed with Central Indiana Dance Ensemble (CIDE), under the artistic direction of Suzann DeLay, including full length productions of The Nutcracker, Cinderella, Alice in Wonderland, Peter Pan, The Sleeping Beauty, and Coppelia. Hannah has also performed professionally in productions with the Radio City Rockettes, playing the role of Clara for two years in the Radio City Christmas Spectacular at the Grand Ole Opry House in Nashville, Tennessee. Her solo performances at Youth America Grand Prix in Chicago, IL have earned her awards in both the classical and contemporary divisions. This past year, Hannah received scholarships at the Regional Dance America Festival in Pittsburgh, PA and at the Carey Rose Memorial Scholarship competition in Chicago, IL and has previously received the regional American Dance Awards Junior Dancer of the Year. This summer, Hannah returned to train with the School of American Ballet at Lincoln Center in New York City. She hopes one day to perform with a professional ballet company.